SO YOU THINK YOU CAN DANCE starts tomorrow night (Thursday, May 21, 8/7c on Fox). I consider this the finest television entertainment there has ever been, and so do my good friends (several large men included.) We're having a party tomorrow to kick off season. My two favorite things are coming together: food and dancing. I'm providing my favorite Texas Caviar recipe. For those of you unfamiliar with Texas Caviar, it is a ridiculously chunky salsa with black eyed peas, golden hominy, bell peppers, and lots of other goodness. 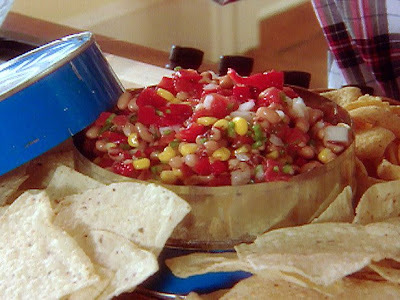 As a funny side note: I once helped my brother make this salsa for a party. He is fairly novice in the kitchen, so i laughed when he asked me "Should we put butter in this?" But then he said, "Are we going to put some sort of meat in there?" and I finally lost it, when we mixed all the ingredients together, and he said, "So now we cook it?" Texas Caviar 4 roma tomatoes diced 1 bunch green onions, chopped 1 clove garlic, finely chopped 1 green bell pepper 1 can black eyed peas, drained 1 can golden hominy, drained 1 can mild salsa (Pace Picante has never let me down) Mix ingredients together. Chill over night (this lets the flavors mix well), and serve with tortilla chips.